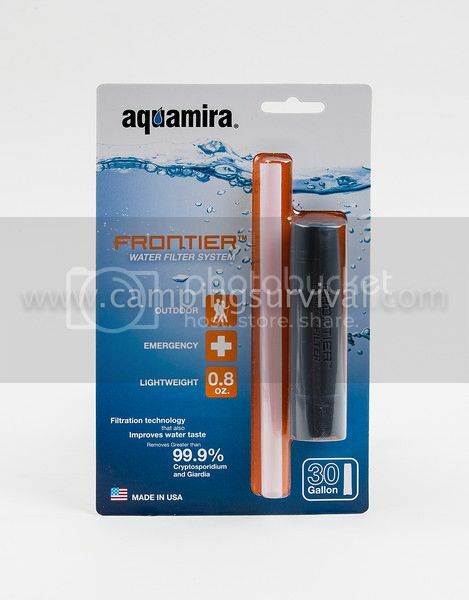 The Frontier Emergency Water Filter System Straw is the ideal "just in case" filter for emergency use when traveling, hiking and fishing. Also ideal as a backup filter for multi-day backpacking trips. The Frontier Filter can be used to drink from any bottle or cup, or directly from water sources. Removes contaminates down to 2 microns in size including wide spread pathogens such as giardia, cryptosporidium and large bacteria. Frontier's ultra lightweight and compact package size fits in the smallest day pack, waist pack or pocket. Available in Blister Pack. The ultra light and compact Frontier™ Filter easily slips into a day pack, waist pack or travel luggage and is ready when you need it. Frontier is the perfect 'just in case' back-up filter. Carry the Frontier Filter as a back up on multi-day backpacking trips in case larger pump filters clog or become damaged. The Frontier Filter can also be used in conjunction with chemical treatments for maximum protection. The Frontier Filter can be used to drink from any water bottle, cup or directly from water sources. Frontier will remove pathogens and contaminants down to 2 microns in size including Giardia, Cryptosporidium and E.Coli*. Activated carbon helps reduce waterborne chemicals and improves water taste. Aquamira Filtration Technology is tested and certified to reduce chlorine, bad tastes and odors and remove >99.9% of Giardia and Cryptosporifium, the two leading causes of waterborne illnesses. Activated Coconut Shell Carbon reduces organic contaminants, waterborne chemicals, improves taste and eliminates offensive odors. Miraguard Antimicrobial Technology suppresses the growth of bacteria, algae, gungus, mold and mildew within the filter media. Miraguard does not protect users against food borne or disease causing bacteria, viruses, germs or other disease causing organisms. Note: According to the Institute of Medicine in a temperate climate adequate intake of water for men is 3 liters (about 13 cups or .793 gallons) of total beverages a day, adequate intake for women is 2.2 liters (about 9 cups or .581 gallons) of total beverages per day. Filter Prep: A small amount of harmless carbon dust will be expelled on initial use. To remove carbon dust, draw water halfway up straw, Remove straw and discard water. Re-attach straw and drink normally. Attach strw end firmly onto filter outlet. Fill bottle or cup from water source, insert filter and drink from straw. Do not submerge drinking straw into contaminated water. Allow filter to air dry for 48 hours before storage. *Note: Frontier Filter will not remove viruses or bacteria smaller than 2 microns (E. Coli bacteria is larger than 2 microns). If viruses or smaller bacteria are suspected, use a certified chemical treatment or boil water before filtering. Good news. The frontier added a new straw and updated the filter sometime at the beginning of 2012. The frontier filter is much improved over earlier models. In fact, drink from this filter for a few days then taste the water you are used to. You will be amazed at the improved taste of the filtered water. I\'ve kept one in my edc bag, and it gets banged up, for over a year now and it\'s held up fine.